Staff and community members have been knitting and crocheting the poppies for about two months as part of a movement inspired by the 5000 Poppies initiative, a worldwide tribute of respect and remembrance to those who have served in all wars, conflicts and peacekeeping operations, their families and their communities. Project coordinator Lilly Dolenec said the hospital was overwhelmed by the support of the local community. 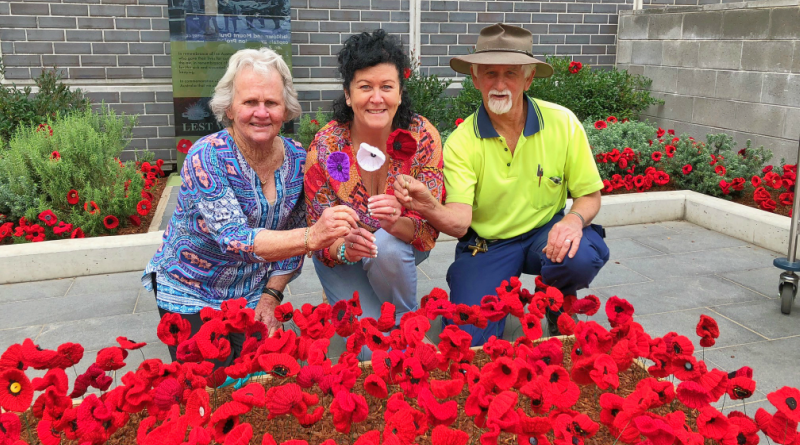 “Blacktown Hospital has a beautiful ANZAC Memorial at the main entry and we thought it would be an ideal location for a poppy garden to honour those who served, and continue to serve,’ Lilly said. “We received more than 2,000 unique poppies, all individually knitted or crocheted, to create our Remembrance Day tribute. “We particularly wanted to recognise people who served in nursing, medical and support roles in conflicts and peacekeeping,” she said. Lilly said the Blacktown tribute contains about 1200 red poppies, with one purple poppy to honour the many service animals, and one white poppy for peace. Many of the poppies were dedicated to family members, including First and Second World War veterans, and family members who died in conflicts. “We had some very moving tributes to family members, including brothers, uncles and grandfathers, and one to Emma Mary Duffy, a nurse who enlisted in 1917 in the Australian Army Nursing Service,” Lilly said. Blacktown Hospital also features an artwork with a silhouette of an Aussie Digger, adorned with poppies. The work was created by Mark Fuller (whose wife Lisa works in the Bookings Office) and Michelle Wilson, and was inspired by the touching poppy tributes received by the hospital. Lilly said the project would not have been possible without the support of the hospital staff and volunteers. “Thank you to everyone who so generously contributed poppies, and sincere thanks to Jane Chan, Michelle Wilson and the Surgical Bookings Office team, Barbara Leabon and the Blacktown Hospital volunteers, and hospital maintenance, especially gardener Ian Dobbie, for their support,” Lilly said. Poppies are also on display near Mount Druitt Hospital’s ANZAC Garden. Remembrance Day Services will be held at Mount Druitt Hospital on Tuesday 13 November at 11am, and Blacktown Hospital on Wednesday 14 November at 11am.